Kyra Halland's The Lost Book of Anggird takes the reader on a journey to a world in which magic exists - but the magic is a complicated balancing act, and something is not right with the balance anymore. The scholar Roric, and his new translator Perrare, will embark on a dangerous adventure to restore the magic to its original state. Perrare, in the beginning, does not believe that what Roric is up to is such a good idea. It all started with some old, forbidden books Roric found in a hidden chamber in a box. He believes that magic originally was a power without flaws that did not need any complicated balancing. What he finds out with Perarre's help, and what he experiences when he opens a book that should never have been opened (in the eyes of some), is connected to more than just magic. And some people in power are quite eager for the old knowledge to never make it to the light again. 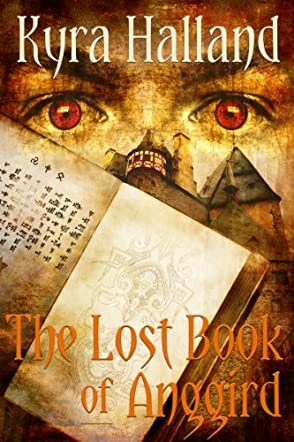 The Lost Book of Anggird by Kyra Halland was a fantastic read. The characters are very well developed, and it's lovely to see how Roric changes during the book - from being such a meticulous, distant scholar to actually being a really likeable guy (Perrare certainly seems to think so, too). I found the idea behind readers (i.e. people who can read the intent and feelings of the writer of a book), the unbalanced magic, and corrupted mages fascinating. It was a different type of story, and I am sure many other readers will also find it very interesting.